The South China Sea represents one of the world’s most important strategic waterways. The intricate web of sea-lanes, which passes through the disputed region connecting the Indian Ocean to East Asia accounts for $5.3 trillion USD of trade each year. In addition, the South China Sea has estimated oil reserves of seven billion barrels, and an estimated 900 trillion cubic feet of natural gas, leading Beijing to dub the South China Sea a ‘second Persian Gulf’. Combined with the strategic ambiguity surrounding China’s intentions to actively enforce its 9-Dash-Line claim, this news have prompted a renewed focus on the stability of the South China Sea by the United States Pacific Command (PACOM). Since the December 2013 revelations of China’s land reclamation program, we have witnessed a steady cycle of escalation between Beijing and Washington that is leading to a militarisation of the disputed waterways. Some weeks after the People’s Liberation Army (PLA) began deploying HQ-9 surface-to-air missile batteries and flying J-11 fighter aircraft to Woody Island in the Paracel Archipelago chain in the south of Hainan Island, PACOM Commander Admiral Harry Harris Jr. delivered a speech in New Delhion March 2, 2016, seeking to engage India in the increasingly disputed waters of the Indo-Pacific. The continued stability of the international order undoubtedly necessitates Sino-American cooperation, especially in the realm of climate change. However, it is evident that Beijing and Washington are falling into patterns of behaviour in the South China Sea more characteristic of military rivals than economic competitors. Since coming to power in November 2012, Xi Jinping has sought to aggressively establish China’s sovereignty in the disputed maritime spaces of the Asia-Pacific. In the last three years, this has been visible both in the Senkaku/Diaoyu dispute with Japan and now, in the South China Sea. Beijing has tried to impede freedom of navigation by other claimant states using coastguard and fishing vessels to force away other nations’ ships. The Asia Maritime Transparency Initiative in Washington D.C. has documented repeated instances, where Chinese Coastguard vessels have blockaded fishing grounds within the Philippines’ territorial waters, launched incursions into waters off Malaysia -a state with a significant Chinese diaspora- and engaged in a campaign of repeated collisions with Vietnamese vessels. The city of Sansha exemplifies China’s assertiveness in the South China Sea. Home to fewer than 1,500 Chinese citizens scattered over the Amphitrite Group, with the centre of government located on Woody Island, Beijing now treats this outpost as a province of China that administers the disputed Spratly and Paracel Islands chain and the wider South China Sea, regardless of the presence of other nations’ islands. Passports for mainland citizens are now published with maps of the nine-dash line upon them including Sansha. In March 2016, Beijing announced civilian flights from Mainland China, further seeking to normalize Sansha and infuriating neighbouring states. There are now fears that Beijing will, through its sheer size and determination, neutralize the South China Sea, effectively confirming China as the dominant actor to whom other nations must acquiesce. Until recently, Beijing’s core interests were related solely to Taiwan, Tibet and Xinjiang, but in July 2015, a sweeping national security bill was passed which amongst other things designated the South China Sea as a ‘core interest to China’, even though it is comparatively distant from the mainland. In the previously designated regions, China has been willing to deploy substantial military and economic resources to forcefully bring them and their populations into Beijing’s orbit. The question is whether this will be replicated in the South China Sea. China now has significant naval capabilities to enforce its maritime territorial claims. Since Deng Xiaoping opened up China to international investors in the early 1980s, the state has undergone a massive economic expansion. In recent years this has provided the financial weight to support a program of modernization of both the PLO and the Coast Guard, which has been the principal force asserting Beijing’s territorial claims. The use of the ‘white hulled’ coast guard cutters suggests that when faced with militarily inferior actors such as Malaysia, Philippines and Vietnam, Beijing was not willing to militarize territorial disputes. In the last six months however, the arrival in force of the United States Navy has shifted the calculus of risk. Beijing has since begun to militarise the Paracel Islands. Since satellite and airborne surveillance photographs confirmed the start of the land reclamation program, China has downplayed the military nature of these facilities and has repeatedly stressed that the islands can serve as platforms for maritime search and rescue, scientific research, disaster relief and even aid in navigation. South East Asian states remain unconvinced, however. Amid increased regional tensions, the United States has conducted a series of freedom of navigation operations (FONOPS), deploying guided missile destroyers to within 12 nautical miles of disputed reefs. The first of these sailed past Subi Reef in the Spratly island chain in October 2015, while the second deployment occurred 95 days later in early January, near Triton Island in the disputed Paracel Islands. Reaction from the Chinese foreign ministry and state media was vitriolic, with accusations that the United States had violated Chinese territorial waters, and Beijing responded by deploying missiles to the disputed waters in February. 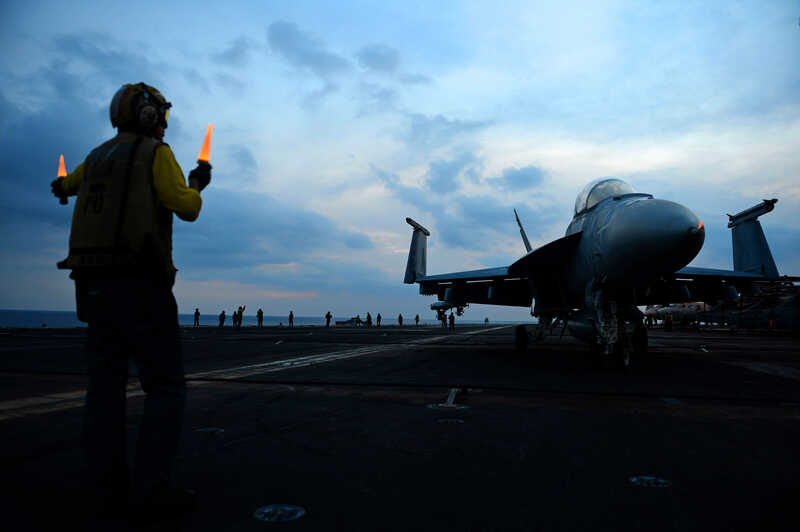 On March 5, 2016, the US Navy’s 7th Fleet announced that the USS John C Stennis (CVN-74) carrier strike group would conduct ‘routine operations’ in the eastern half of the South China Sea. As with the FONOPS, the arrival of a United States carrier was heavily criticised by Hong Lei, the spokesman for the Chinese Foreign Ministry, who stated “What the United States has done has intensified tensions and is most likely to cause militarization in the South China Sea”. While the deployment of the strike group may have been routine, its arrival weeks after the announcement of Chinese missiles suggests a deliberate signal to Beijing. It remains to be seen whether Beijing will follow up rhetoric with additional military hardware. Given its actions and statements in the last 18 months, it is hard to imagine that it will back down in the face of further FONOPs by the US Navy. Likewise, given Washington’s strict support for freedom of navigation in international waters, it seems unlikely that the most powerful navy in the world will give into Chinese demands to recognise the water around its artificial islands as territorial waters. Given these two competing interests, a cycle of escalation is now underway in the South China Sea.